The Seminole tribe have been serious players in the gaming industry for a while now. In 2007, they purchased Hard Rock International (the first acquisition of its kind by any tribe) and have continued to expand the brand and its assets since then. 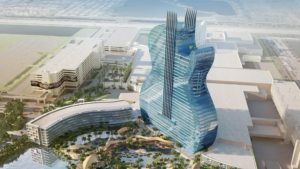 The group has just revealed their plans for a major renovation of their hotel and casino resort in Florida, which include a 450-foot guitar tower. Besides the eye-catching design, the renovation will enlarge the venue’s capacity to almost double its current size. The cost of the upgrade is estimated at US$1.5 billion. Sometimes confused with the Hard Rock Café in Hollywood, California, the Hard Rock Hotel & Casino Hollywood is located in Florida, between Fort Lauderdale and Miami. The current facility, situated on the Hollywood Seminole Reservation, is set to double in size and will include a 145,000 sq ft casino, and an 18,000 sq ft poker room. Even before the renovations start, the resort is definitely on the impressive side with 481 quest rooms and 81 suites, all with access to the tropical swimming pools that decorate the front of the hotel. The casino will offer a staggering 3267 slot machines and 178 table games, but the new plans include changes across all the facilities at the location. A new range of shopping outlets will be added as well as additional dining and recreational options. The venue’s main entertainment arena – Hard Rock Live – will undergo an expansion from 5,500 seats to 7,000. Hard Rock Live hosts a busy annual calendar of live acts and sporting events. The Hard Rock guitar statue has become synonymous with the brand itself, but if the new plans for the Florida resort are actually followed through, this could take the venue to landmark status. The 450-foot guitar tower will include 640 luxury hotel suites, an enormous 41,000 sq ft spa, and a 10-acre pool area, along with a business and conference center. Needless to say, there will also be a number of additional dining options and entertainment areas on the lower floors. The impressive guitar shape was sparked from the imagination of James F. Allen, the CEO of Seminole Gaming and Chairman of Hard Rock International. Allen brought on the Klai Juba Wald architectural firm from Las Vegas to bring the idea to life. Other companies involved in the design and logistics of this huge project are: Cleo Design, Las Vegas; the Rockwell Group, New York; Laurence Lee Associates, Los Angeles; Wimberly Interiors, Coral Gables; EDSA, Fort Lauderdale; Wilson Associates, Dallas; and Suffolk-Yates who will be managing the construction. While the plans for the new venue have not all been finalized, on paper, the project is receiving a lot of publicity, with mostly positive reactions from the public. So, if you’ve always dreamed of playing casino games and sleeping in a guitar, you might be able to tick that one off your bucket list by the end of 2019.